↑ "Boeing P-8A Poseidon successfully completes 1st flight." Archived 30 अप्रैल 2009 at the वेबैक मशीन. Boeing, 27 April 2009. ↑ Majumdar, Dave. "Picture: Boeing delivers first production P-8A." Flight International, 8 March 2012. ↑ "P-8 Poseidon". Boeing.com. अभिगमन तिथि 7 October 2015. ↑ "Boeing: Commercial". अभिगमन तिथि 10 April 2018. ↑ "GAO-13-294SP DEFENSE ACQUISITIONS Assessments of Selected Weapon Programs" (PDF). US Government Accountability Office. March 2013. पपृ॰ 103–4. अभिगमन तिथि 26 May 2013. ↑ "United States Department Of Defense Fiscal Year 2015 Budget Request Program Acquisition Cost By Weapon System" (pdf). Office Of The Under Secretary Of Defense (Comptroller)/ Chief Financial Officer. March 2014. पृ॰ 24. ↑ Boeing. U.S. Navy Awards Boeing $2.5 Billion Contract for 20 More P-8A Poseidon Aircraft. प्रेस रिलीज़. 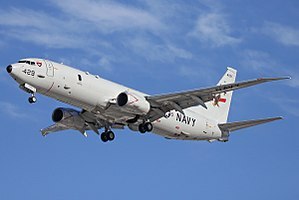 http://boeing.mediaroom.com/2016-01-29-U-S-Navy-Awards-Boeing-2-5-Billion-Contract-for-20-More-P-8A-Poseidon-Aircraft. अभिगमन तिथि: 24 November 2016. ↑ "AN/ALQ-240(V)1 Airborne Maritime Patrol Systems". northropgrumman.com. अभिगमन तिथि 11 February 2017.